Stairway lighting ideas – If you want to add dramatic elements to your stairway, you may be looking for some stairway lighting ideas to get inspired with. Besides the dramatic effect with lighting fixture of a stairway, it will emphasize the stairway’s existence. The lightings somehow would draw attention. So, the appearance of the stairway design would shine brighter. Usually, a stairway is unseen. It feels like just a functional element of the house without even have a chance to shine. Well, this is the time you take control of the stairway’s destiny. You could turn a flat and boring unseen stairway to become a centerpiece. Adding lights to the stairway, not only it could provide some practical function, but also it will make your stairway to more beautiful. Lights for stairway is very useful. Sometimes in the dark, we feel insecure about walking up or down the stairway. Using the right lightings, you can properly illuminate the stairway and make the house safer. if you want to add wow factor to your stairway design, you might go with this stairway light design. This will fit in stone stairways or the classic stairway designs which have runners. The lights are set a little bit higher to get a wash of light over the stairway. 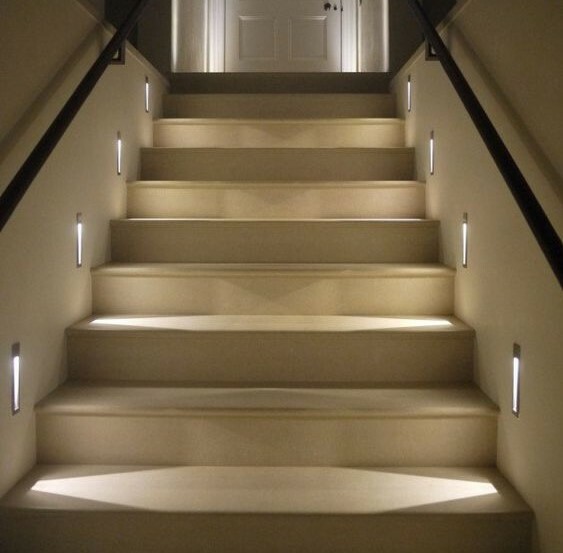 This is the lighting design to create a stronger architectural feature to the stairway design. 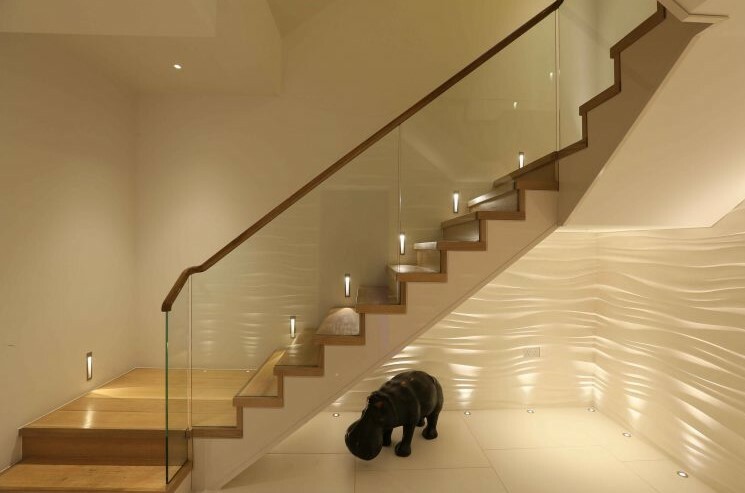 Lighting under the stair would make a spacious area which you could fill up with simple sculpture like that black hippo. This photo uses Lucca uplights to add a dramatic effect to the textured wall. This is a light design for open riser stairway. The lights can be hidden away from sight under each tread. It would look invisible when the LED light is off. When you turn it on at night or anytime, it would create a stunningly soft floating effect. 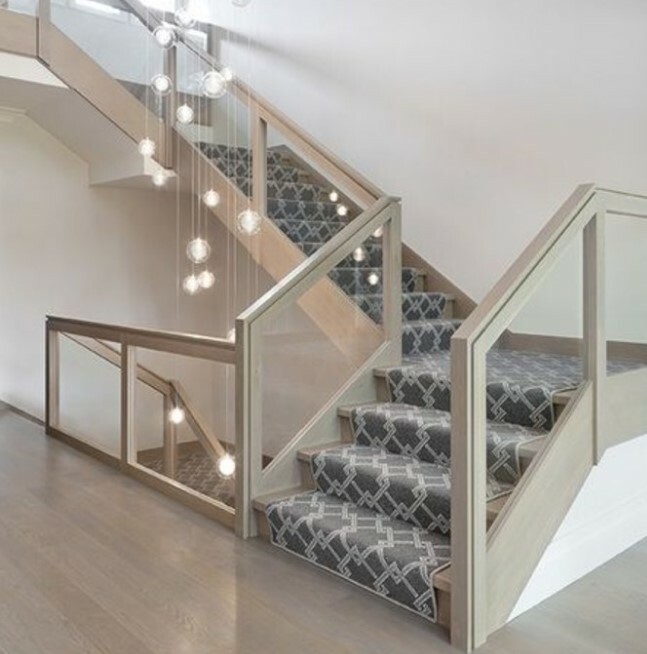 Hint: Before choosing the right lighting treatment for your stairway, you need to consider the shape, the size, and the design of your stairway. If you follow the rule, it’s not gonna be a mess. 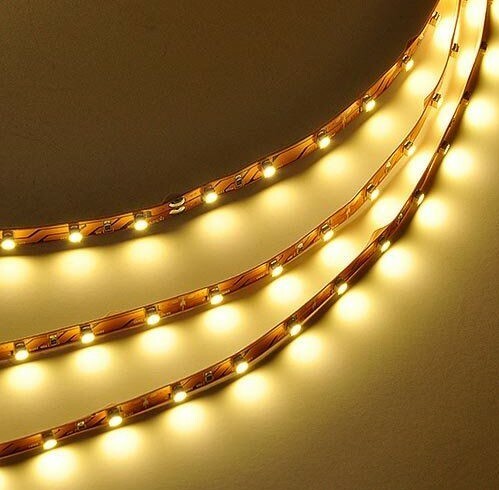 Have you ever hear about the LED lights that can be turned on automatically just by using motion? Well, you can have that for your stairway lighting. This lighting idea can be a great one for you to save your electricity bill budget. It is because the lights will be turned on, only when someone walks through it. So, when you are not around or not using the stairs, the lights would be off. It would really affect your payment on the electricity bill. It will also give your stairway a futuristic touch. Hint: You can actually install this lighting by yourself by following the guide. You need to make sure that your staircase is ready for this technology because some type of stair design might feel awkward with this lighting treatment. Even though the money on electricity bill is safe, the money on purchasing it will talk much, because the price would not be cheap. This is one of the great ideas you can use for your stair. 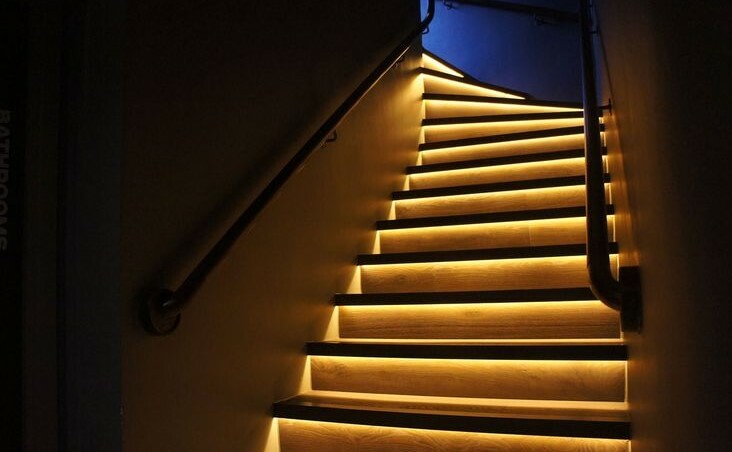 Using LED light strips would really make a good impact on your stairway design. 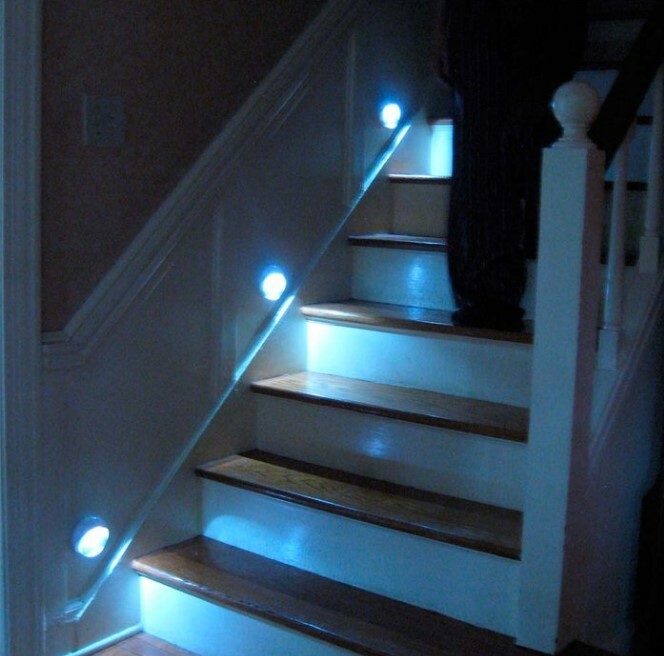 If you consider too light up your basement stairs, this is a good option, to begin with. Hint: This is the safest option you have when dealing with lighting for a stairway. This option is quite ordinary, it’s used more because of its functionality, not because of its beauty. If you want to make your stairway to be dazzling, you need to think again to choose this one. 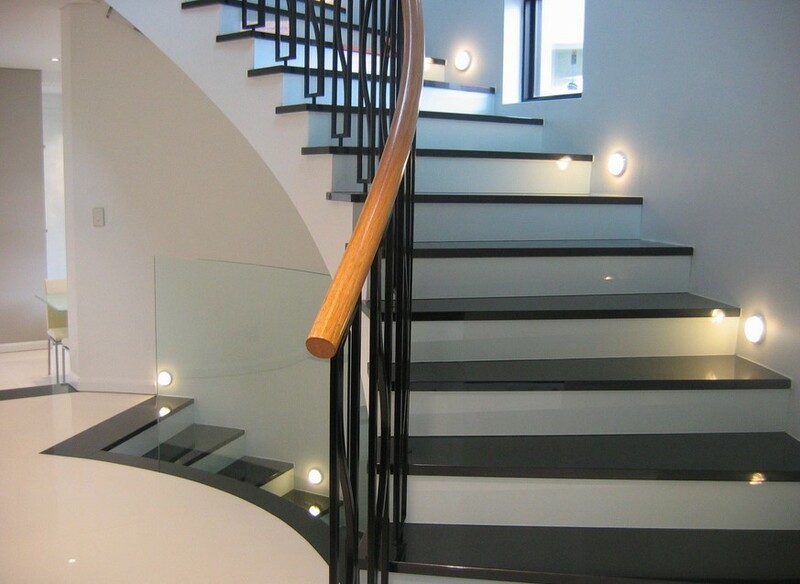 The contemporary stair lighting also has several types. Choose one that fits your house the most. The dark brown stairway looks stunning along with the yellow dim lighting. The shape of the light really matches the design of the stairway. 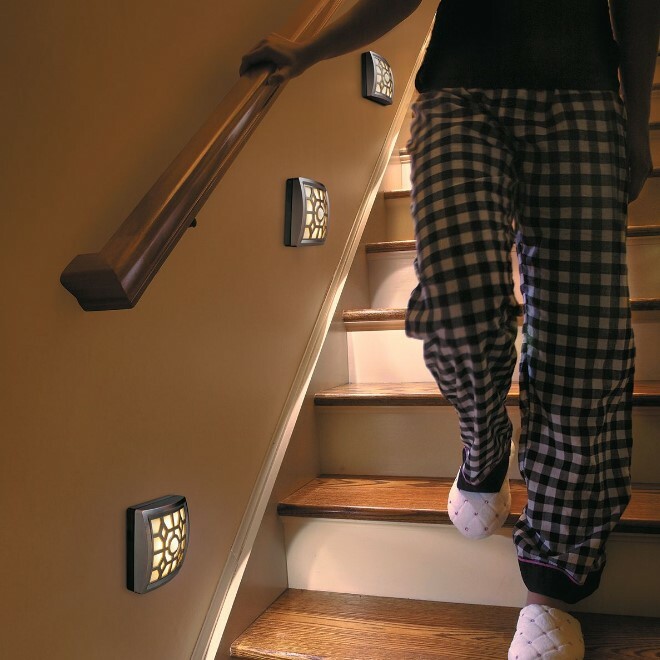 You do not need a lot of lamps to light up your stairway, one stairway only needs four rectangular shape lights. It’s bright enough for this contemporary house design. 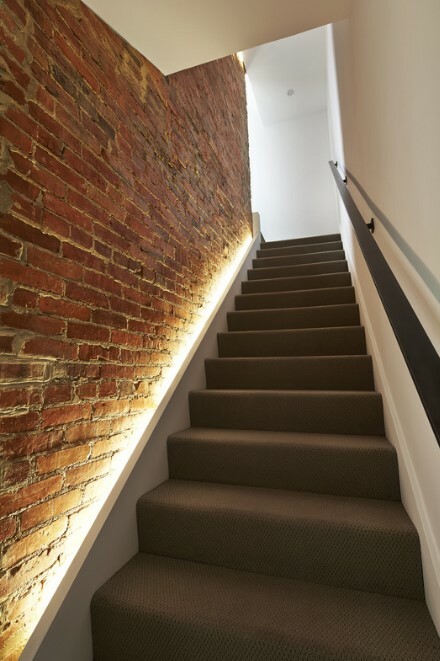 Another type of stairway lighting ideas, you can installed this unique lighting on the wall similar to the rectangular shape lights. This chic lighting design obstructs lights. They look like little stars. 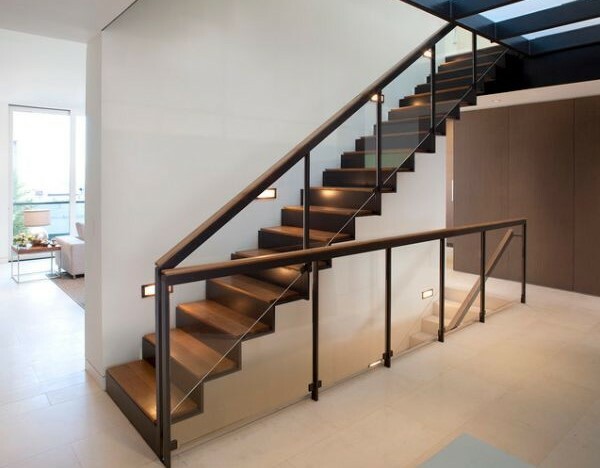 The sleek design of the stairway in this contemporary house really suitable for that lighting fixture. Hint: If you want to have this kind of lighting that is built on the walls, you may wanna keep the rest of the wall to be simple and clean. If you have too many accessories or decoration on the walls, it will lose the sense of drama on the stairway. Let’s talk about the outdoor stair lights. If you are planning to light up your decking and pathway, the treatment would be a little bit different to the indoor stairs. Those amazing little stars on the edge of the decking makes a sparkling attention to the pathways. Hint: You might think that an outdoor stairway light should be brighter than the indoor. 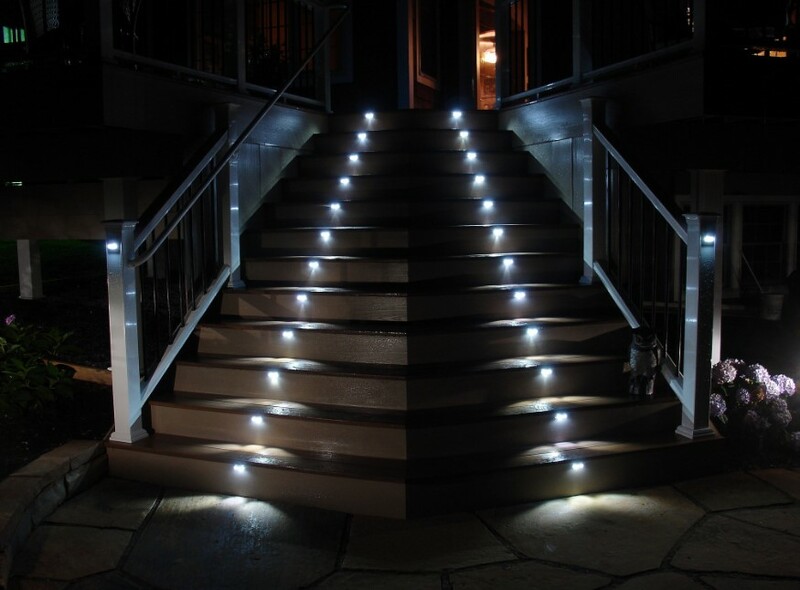 On the other hand, do not be afraid of going too dark with a small amount of shine in the outdoor stair lightings. It will surprisingly add a sparkling effect to the surrounding. 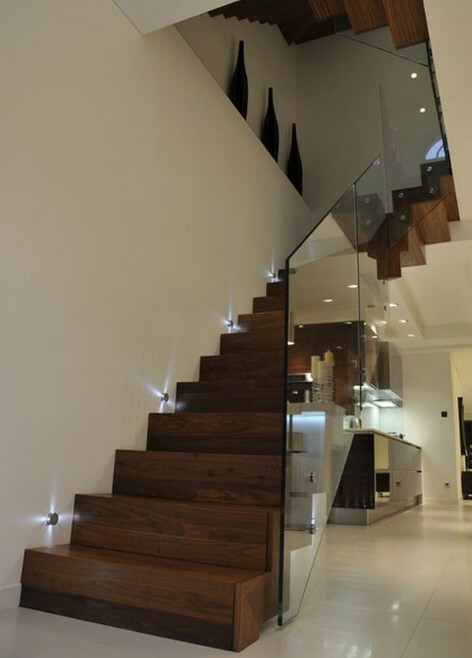 This luxurious stair looks so impressive with that artistic lighting fixture in the center. The yellow lights from the bulbs offer dramatic effect to the stairway. 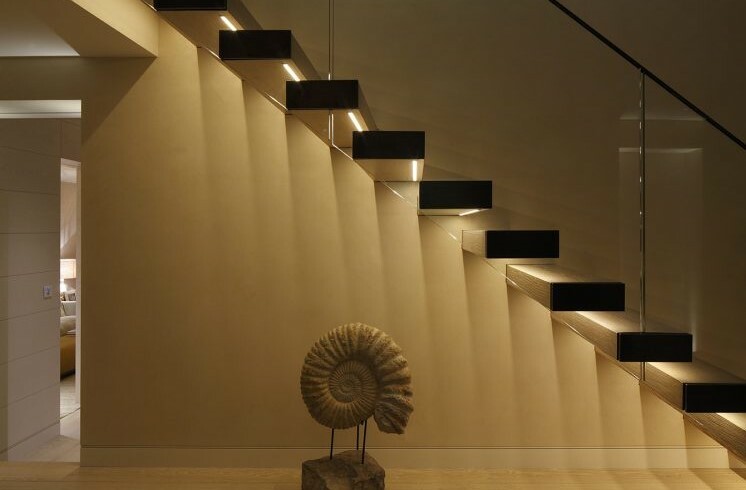 This lighting design really turns your staircase into a stunning centerpiece. 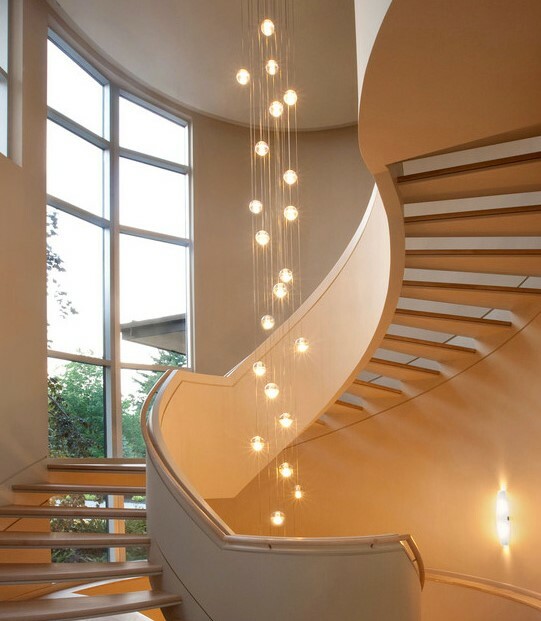 Hint: A lighting design like this central multi-drop pendant lighting is only perfect for this spiral stairs. If you use it also with other stairs like L shaped ones or winder ones, it would be unmatched. Want to light up your sky loft stair? Try to have a simple side lightings at the edge of the stairs. The bricked wall really make a statement right there. It strengthens the existence of its textured. The dramatic effect on the wall is the rustic sight all the way to the sky loft. Hint: A number of lights in sky loft stairs would really decide the impression of the stair atmosphere. You can choose to have a small amount of light to be the little accents of the stairways, or you can go bright all the way to the top. Let’s create an amazing outdoor lighting with the step and stair lighting design. 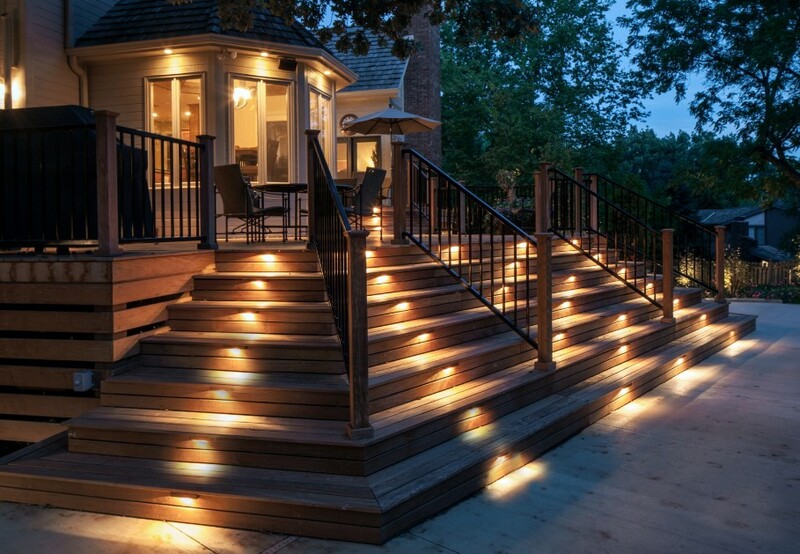 You can light up your dark outdoor with the only bunch of stair lights. It would create an ultimate dramatic effect to the whole house from the outside. The lights are installed in the middle of each step which creates an awesome arrangement of lightings. Hint: Set your outdoor to be darker than before by eliminating some of the main lightings. Then, your set of stair lights would be ready to steal the spot to amazed many people. You will have a festive front yard or back yard. You can call this multi-drop lighting pendant as Brooklyn style stair lighting. This Brooklyn lighting stair design can be a great idea for you who has a stairwell just like that. The lights do not have to be on the steps, this stylish pendant would exactly light up your stairway. Hint: The carpet really make a good decoration to the staircase but you have to consider the pattern, make sure the carpet design or pattern suitable with other elements and style. 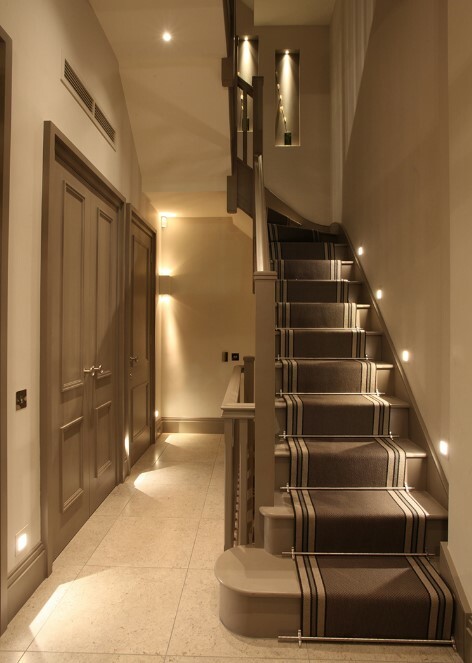 Indoor stairs are perfect for stair lighting especially the area is a bit darker. If the area is already bright along with the brighter shades of white around the room, the stair lighting function can be useless. 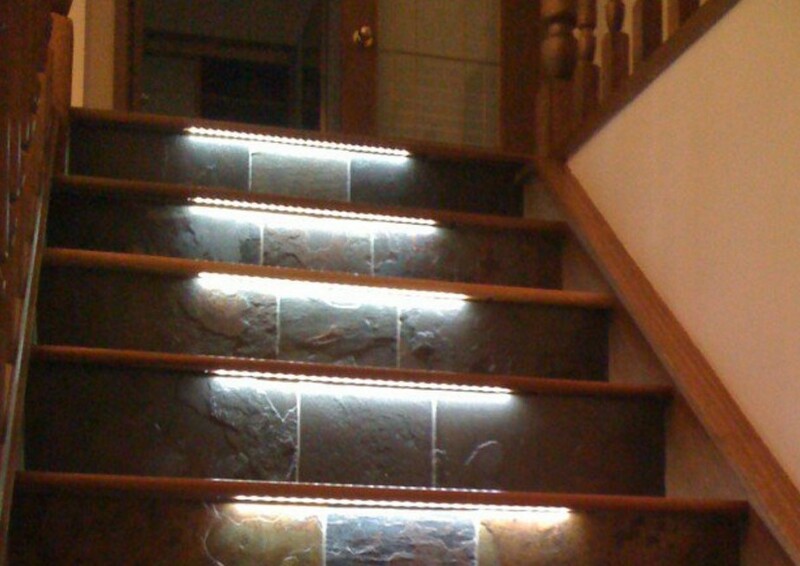 You can install the LED stairway under the staircase edges to create a wonderful impact. Hint: If you want it to be more fun and pleasing to the eye, let’s choose another color instead of ordinary white or yellow. You can choose the red one or the light blue which would be unique, but remember to match it with the style of surroundings. 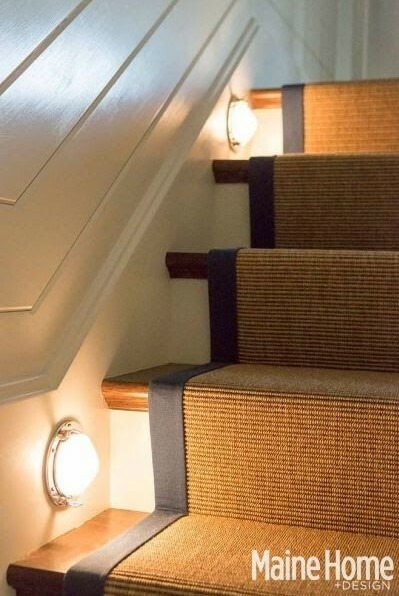 Stairway lighting ideas. The stair types in the common house are the straight run stairs. But, there are also many house design that has another kind of stairs, the L shaped stairs, spiral stairs, U stairs, double L stairs, and winder stairs. 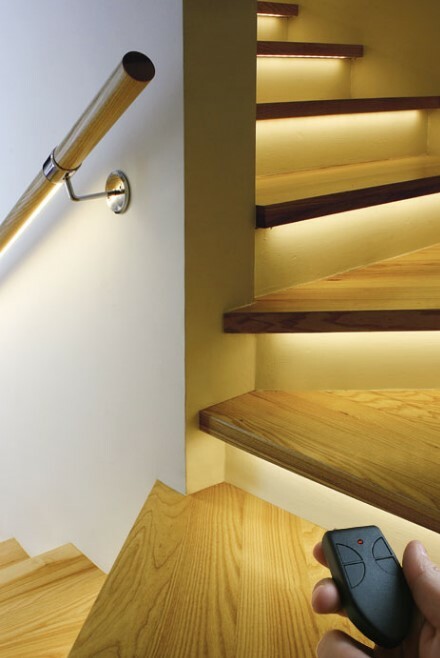 You can get the KLUS LED lights which would fit into any type of stairs. Hint: For DIYers, this type of stairway lighting can be self-installed. You just need to prepare some needed materials and follow the steps carefully. Then, you can set it in any spot you like. 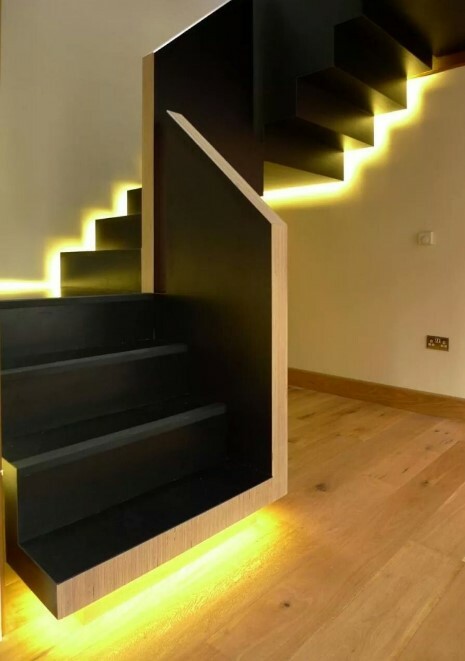 Take a look at this black staircase, it is illuminated by the yellow light which is pretty interesting and unique. The combination of bold black and light yellow is surprisingly exciting. This kind of lighting design creates ultimate dramatic effects to the whole area. You can’t prevent looking at this stunning stairway. Hint: If you do not like black, you can always change it into the bold color you like such as bold brown, red, or navy. The light yellow would be a great accent for those colors. The key to creating a nautical stairway is to add such stair carpet. Check out the lighting design that seems very supportive to the texture of the carpet. The carpet addition on stairs is quite common in the traditional or nautical house style. It’s also so helpful to prevent the slippery surface of the steps. Hint: Cleaning the carpet regularly is a must. You have to make sure that it’s always clean. When it gets dirty, clean it as soon as possible. Try not to leave any mark because it would make a bad impact on the stairway’s looks. Changing it regularly would cost more budget to buy another carpet. Choosing the best one from those stairway lighting ideas might not be difficult anymore. You just have to match the lighting design with the style of your house and your taste of home design. The thing you have to remember, lighting on stairs are not so important when you already have the bright main lighting fixture. Even though you already have the main lighting, you may need stairway lighting to make it awesome.